As iPads and similar touch-based tablets gain popularity in schools, many express concerns over the efficacy of a virtual keyboard. Many believe that a traditional keyboard is necessary for students to develop typing skills sufficiently. At our school, iPads are used throughout the elementary and students in years 4-6 (grades 3-5) each have his or her own. Several teachers have expressed concern about typing speed and technique, and it has been suggested that external keyboards for the iPads may improve keyboarding development, at least for some students. Is there a difference in speed between using a keyboard and using a virtual keyboard? Are some students significantly better at one form of keyboarding than the other? As a group, there will not be a significant difference between typing on a traditional keyboard and a virtual keyboard. A small set of students will perform better on a traditional keyboard. Eighteen (N=18) students were selected from years 3-6. These students came to the computer lab each day for four days. The first day was an introduction and students were each given the opportunity to practice the typing test on their iPad and on the computer keyboard. These results were not recorded. The typing test used was a web-based test available at http://typing-speed-test.aoeu.eu/ . The reasons for choosing this test were one, that it worked equally well on iPad and computer, and second, it uses simple words. Why are there no difficult words in this test? The tests were given on three consecutive days. Each day, students took the typing test four times — twice on the iPad and twice on the computer. The order was randomized each day. 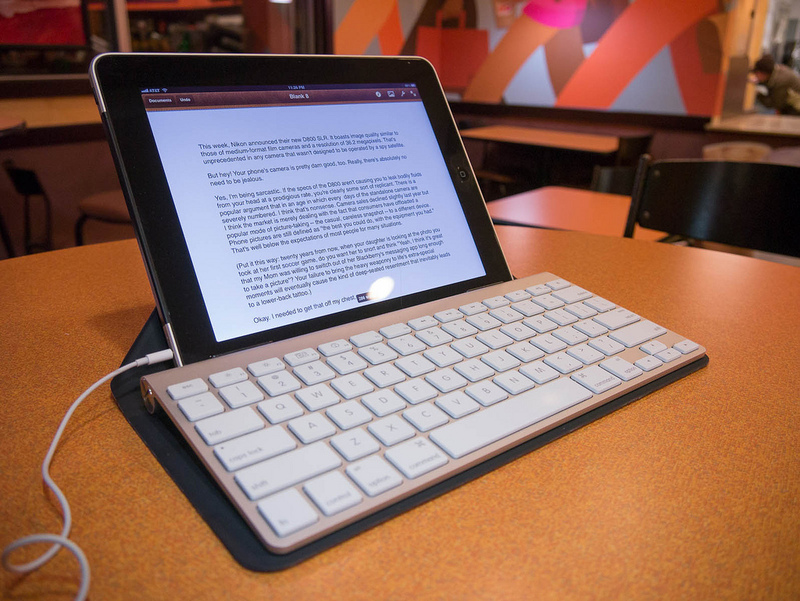 Once during the three days, each student used a ZAG Bluetooth keyboard with their iPad instead of using the iPad’s virtual keyboard. In order to minimize the effect of outlier scores (although there were not many), the higher of the two scores on each device were used. Thus, if a student scored a 20 & 22 WPM on the iPad’s virtual keyboard, only the 22 would be used. Year 3 student scores were significantly lower than older students. This may be due to a combination of factors including natural developmental differences and limited prior typing experiences. (e.g. Year 3 is not 1:1 and have done very little typing in previous years.) Thus, year 3 students results were excluded from overall averages. This small study makes it clear that the perception that students type faster on traditional keyboards is not correct for our current elementary students. In fact, students were slightly faster on a virtual keyboard than on a computer or iPad keyboard. Thus, we accept the first hypothesis. The second hypothesis, however, must be rejected: in our sample, no students were significantly faster with a traditional keyboard, and all students scored very close to the same regardless of which technology they used. This study has some limitations. First, students the higher the year-level, the higher students scored. The reason for this increase is not known. Perhaps it is simply continued practice and natural development in hand-eye coordination. On the other hand, this is the first year students have had iPads, and we cannot rule out the possibility that their year-over-year speed increases are because of previous years learning keyboarding technique on a traditional keyboard. If so, we don’t know if this skill could have been developed at a similar rate on iPads. The lack of longitudinal data and absence of student typing speeds from previous years, makes it difficult to extrapolate these results to older students or adults who have developed typing skills primarily through a virtual keyboard. (i.e. if current year 6 students continue only using an iPad for the next five years, will their typing speeds be comparable to current year 12 students?) At least one other similar study showed that young adults type considerably faster on traditional keyboards (Chaparro et al., 2010), but unlike our students, these subjects had not had months of practice on an iPad. Despite these limitations, this study seems to illustrate an important point: adults who have spent decades typing on a traditional keyboard, find it very difficult to imagine that students can be successful typing efficiently on a virtual keyboard. The evidence here, however, does not support this bias. Maybe it just takes some practice. I was terribly slow typing on my iPad for the first 4 months, but after about a year, I type 35 WPM. I’ll admit to still preferring a traditional keyboard (60+WPM), but I’m now happy to write with whatever device (iPhone included) I have in front of me. How fast do you type on your iPad? Should we care how students input text? Should we be teaching typing?